Happy New Year! 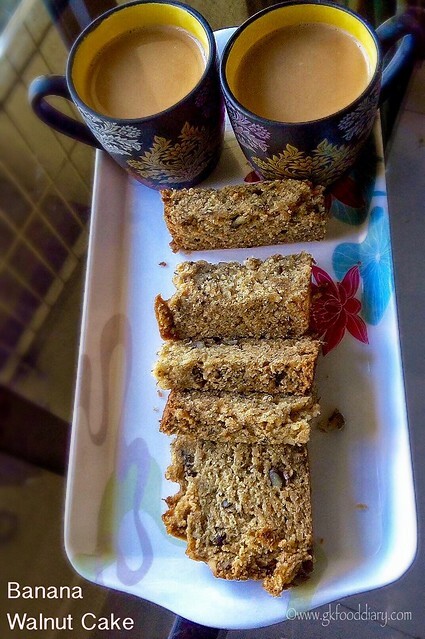 Hope you all had a great celebration 🙂 Let me start this New year with a sweet post – Banana walnut cake: yes you heard it right! Yet another cake recipe in my space after this eggless chocolate cake!! One fine day, my reader friend Tulika approached me to judge a chef of the month recipe contest on her own Facebook group (It’s a group for ladies from Tane, Mumbai and this group was made to encourage all ladies to do something on their own or in the group) and as a token of appreciation she asked me to post the best recipe in my blog. I was so happy & excited to judge the contest and tried my level best to evaluate the recipes. I must say that selecting one winner out of more than ten best recipes was really tough. Kudos to all the ladies who were participated for their efforts! 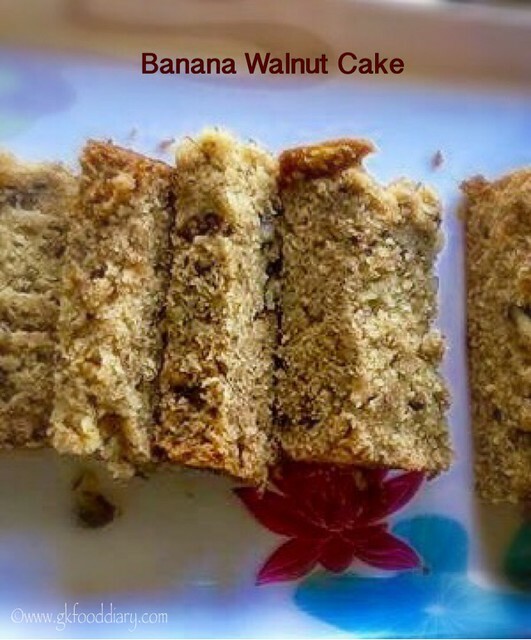 I chose this eggless banana walnut cake recipe by Jyoti Shetty as a winner of the recipe contest. Thanks a lot Tulika for this opportunity ! 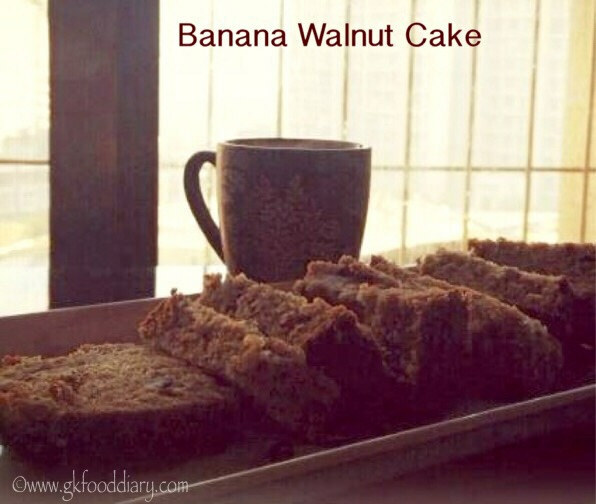 Now without any further delay, Let’s get on to check how to make this easy eggless banana walnut cake recipe. Grease and dust baking tin and preheat oven to 180 degrees. Measure and keep the walnuts ready. Peel and mash the bananas without any lumps. You could use blender too. In a bowl add the mashed bananas, sugar, oil, vanilla essence. Mix thoroughly till the sugar dissolves. Sieve wheat flour, baking powder, baking soda, pinch of salt and pinch of cinnamon powder directly in the same bowl. Now fold the dry ingredients into the wet ingredients part by part and mix well. Add walnuts & fold again. Pour the batter into a tin. Bake in the preheated oven for 25 -35 minutes (baking time depends on the size of the tin you use) at 180° till tooth pick inserted in the centre comes out clean. Allow to cool in tin for 5 minutes . 1. Grease and dust baking tin and preheat oven to 180 degrees. Measure and keep the walnuts ready. Peel and mash the bananas without any lumps. 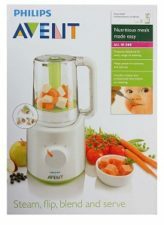 You could use blender too. In a bowl add the mashed bananas, sugar, oil, vanilla essence. Mix thoroughly till the sugar dissolves. Sieve wheat flour, baking powder, baking soda, pinch of salt and pinch of cinnamon powder directly in the same bowl. 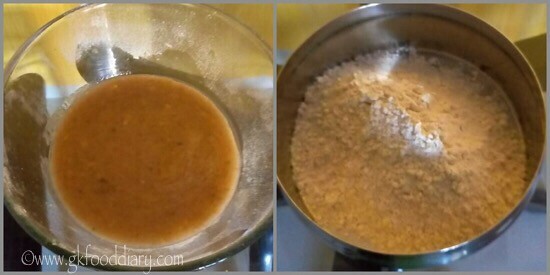 Now fold the dry ingredients into the wet ingredients part by part and mix well. Add walnuts & fold again. Pour the batter into a tin. 2. Bake in the preheated oven for 25 -35 minutes (baking time depends on the size of the tin you use) at 180° till tooth pick inserted in the centre comes out clean. Allow to cool in tin for 5 minutes . 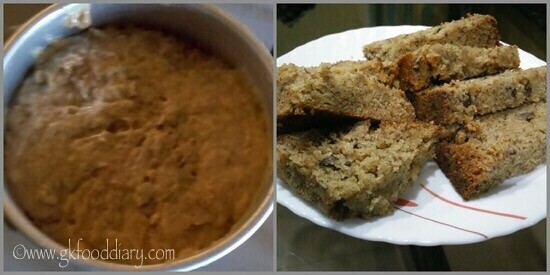 The delicious egg less banana cake is ready to serve ! Whole wheat flour can be replaced with all purpose flour. You could use raisins instead of walnuts or even any nuts. Mixing and measurements are most important for the perfect moist cake. Palm sugar or brown sugar can be used instead of white sugar. Do not fold the batter for more than 2 min. Do not overdo the mixing process as it will make the cake dense and less porous.